By most accounts, the first weekend of the Trump Administration wasn’t good. Characterized as rocky, erratic, terrible, and full of false claims, the ‘not ready for prime time’ transition team is now the ‘not ready for prime-time administration.’ However you want to characterize it, there were certainly some missteps in the Trump administration’s transition from the election to the Inauguration as well as during its first weekend. There will also no doubt be additional missteps along the way over the next four (or eight) years. That said, a lot of this is to be expected. Anytime you have a complete changeover in Washington (even right down to the drapes in the Oval Office), there are going to be issues that come up. By at least one measure, though, the Trump Administration’s transition has been pretty smooth. 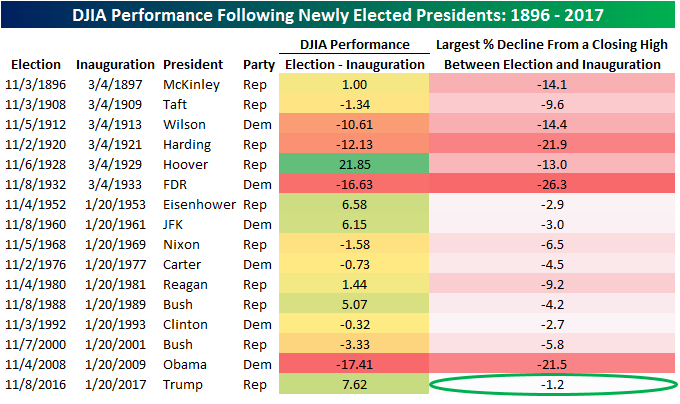 The table below was from this week’s Bespoke Report newsletter and shows how the DJIA performed from Election Day through Inauguration Day for each newly elected President since 1896. Along with the DJIA’s performance during each transition, we also show the maximum percentage decline the index saw from a closing high during each period. With a gain of 7.62% during Trump’s transition, the DJIA had its second best transition performance since 1896. More importantly, with a maximum decline of 1.2% from a closing high, no other newly elected President has ever seen a less volatile transition period! Call it whatever you want, but from the stock market’s perspective at least, the Trump transition was the smoothest ever.